Kevin Bacon is an American movie actor and musician who has starred in such notable films such as Footloose and Apollo 13. Although he has never been nominated for an Academy Award, he has won a Golden Globe Award and three Screen Actors Guild Awards. In 2004 Kevin Bacon performed in the film The Woodsman in which he starred alongside his wife of more than 25 years, fellow movie actress Kyra Sedgwick. Outside of acting, Kevin Bacon is probably most noted for being the main subject of the parlor game Six Degrees of Kevin Bacon. The game is based upon the concept “six degrees of separation” where any two people on Earth are six or fewer acquaintances apart. In the Kevin Bacon game, the challenge is to pick an arbitrary actor, and then find the shortest path to Kevin Bacon through the movie roles of other actors and actresses. 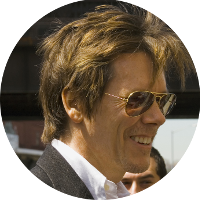 In 2007, Kevin Bacon used the popularity of the game to create his charitable organization SixDegrees.org. Kevin Bacon has some interesting publishing connections in his family. His 2nd great-grandfather was Francis Shubael Smith, co-founder of the publishing firm Street & Smith Publications which was known for its pulp fiction and dime novels. Some of the firms more noted authors included Upton Sinclair, Jack London, and Horatio Alger. More recently Kevin Bacon's maternal grandfather Artemas H. Holmes was a President of Street & Smith and his paternal grandfather Ellis Bacon worked for J. B. Lippincott & Company, a publishing company whose notable authors also included Jack London. So it seems only fitting that among Kevin Bacon's closest famous cousins is Joshua Ballinger Lippincott (aka J. B. Lippincott) the founder of J. B. Lippincott & Company. Of course probably the most important of Kevin Bacon's famous kin is his wife, TV and movie actress Kyra Sedgwick. Kevin and Kyra are 9th cousins, 2 times removed through their common ancestor of Samuel Hinckley. This also gives Kevin and Kyra kinship to Samuel Hinckley's infamous descendant John Hinckley Jr., the man who shot President Ronald Reagan. Many celebrities share family connections to U.S. presidents and Kevin Bacon is no exception. He has a kinship to President Richard Nixon and to both Presidents George Bush. But what Kevin Bacon has unique from other celebrities is one of the closest connections to President Barack Obama through their common ancestor of Shubael Smith. Although I currently limit the number of generations I display on this website for a number of technical reasons, if I were to lift those restrictions and display more of Kevin Bacon's ancestry you would find that he is a direct descendant of William I, King of Scotland who died about 1214. King William I is also known as William the Lion, but not all of Kevin Bacon's royal connections are so distant. He also has a family connection to the current royal family through his 6th great-grandfather Michael Newbold which he shares as a common ancestor with Princess Diana. Kevin Bacon's great-grandfather is Artemas Henry Holmes, father of Artemas H. Holmes mentioned above. In 1845 Artemas married Eliza Jane Bloomer in Galena, Illinois. Sadly Eliza died not too long after and in 1848 Artemas married her sister Mary Margaret Bloomer. Mary Margaret would become Kevin Bacon's 2nd great-grandmother. The Bloomer sisters were part of a very wealthy and influential family in Galena, Illinois. Robert and Edward Bloomer, who I believe were probably brothers of the two sisters, were successful timber barons in Wisconsin around the late 1830s and into the 1840s having built a number of sawmills there. Robert Bloomer was involved in building a sawmill at McGreer's rapids on the Plover River in Portage County, and another mill along the Wisconsin River in what is now Wisconsin Rapids. In fact the town of Bloomer, Wisconsin, was named for them after one of them built a dam and sawmill in the vicinity. In addition to lumber, the Bloomers were also successful merchants. In 1846 the first stocks of goods for sale in Stevens Point was offered by Robert Bloomer. Although the names of a number of the Bloomer family are known, I have not been able to piece together exactly how they all fit together. Some sources claim that the parents of Eliza Jane and Mary Margaret were Robert and Eliza (Donnelly) Bloomer. I have not seen any evidence to support this. In Wisconsin Rapids there is a deed from Robert Bloomer and his wife Eliza N. Bloomer to William Stewart and Peter L. Brown. They executed mortgages to Artimus L. Holmes, father of Artemas Henry Holmes and father-in-law of the Bloomer sisters. The acting attorney for Artimus L. Holmes is a Sarah Donnelly. A very intriguing deed but it does not confirm any of the family relationships. It has been widely reported online and on television that Kevin Bacon has royal connections that go through an ancestor named Anthony Woolhouse. Kevin Bacon's connection to Anthony Woolhouse appears to rely on Kevin's 8th great-grandfather William Shattuck's wife Susanna. Susanna is claimed to be the daughter of John Bernard, son of Richard and Elizabeth (Woolhouse) Bernard. Elizabeth Woolhouse is the daughter of Anthony Woolhouse. Unfortunately there appears to be no evidence to support Susanna being a daughter of John Bernard and other researchers have not excepted the claim as valid. There is also a competing claim that Susanna's maiden name isn't Bernard, but Hayden. Without any supporting evidence and until these issues are resolved, this claim has to be viewed as unproved. Although Kevin Bacon and his wife Kyra Sedgwick are 9th cousins 2 times removed through their common ancestor of Samuel Hinckley, there is a claim that seems to have widespread acceptance online that they are also related through a common ancestor of Charles Hoar. Kyra Sedgwick's connection to Charles Hoar is claimed to be through Anna Flint, an alleged granddaughter of Charles Hoar. The problem is that John Dassett lived until 1699. The Anna Flint who married Timothy Dwight could not be John Dassett's widow and the daughter of Henry Flint. Therefore any connection between Kevin Bacon and Kyra Segwick through Charles Hoar would appear to be false. There have been a number of sources recently, including one television program, that have claimed that Kevin Bacon is related to Brad Pitt as both are said to be descendants of King Henry II of England. While Brad Pitt's descendancy from King Henry II appears to be legitimate, Kevin Bacon's does not. Kevin Bacon's connection to King Henry II is said to go through his 7th great-grandmother Ann, wife of Judge William Budd who was born about 1649 and resided in New Jersey. Ann is said by some researchers to have been the daughter of John Claypoole (also Claypole) and one of his two wives. Some give his first wife Elizabeth Cromwell as Ann's mother, and others give his second wife Mrs. Blanche Stavely as her mother. I have found two sources that at first would seem to back up this claim. The second source is the book The Claypoole Family in America, Vol. 1 (1971) by Evelyn Claypool Bracken. Ms. Bracken lists the children of John Claypoole and his wives on page 10. For John and Elizabeth, she lists the following children: Cromwell, Henry, Oliver, and Martha. She adds the comment, “all died without issue.” For John and Blanche, she lists their children as John, Bridget, Ann, and Elizabeth. Although the evidence is thin, it is easy to see why the two sources above might lead one to believe that Ann is a daughter of John Claypoole and his second wife Blanche. Unfortunately a little further investigation reveals a problem with this claim. There is a series of volumes published by the Oxford University Press known as the Dictionary of National Biography by George Smith. On page 468 in volume IV of the 1908 edition, the children of John Claypoole and Elizabeth Cromwell are listed as Cromwell (died MAY 1678 unmarried), Henry (predeceased his brother), Oliver (died June 1658), and Martha (died January 1664). The list is followed by the comment that "none left issue." So it appears we can rule out Ann as being the daughter of Elizabeth Cromwell. On page 469 of the same book we find the comment, "He [John Claypoole] married a second time, in June 1670, Blanche, widow of Lancelot Stavely, by whom he had one daughter Bridget." Contrary to what appears in The Claypoole Family in America, this would appear to rule out Blanche as Ann's mother, not only for the reason her only daughter was named Bridget, but also the date of their marriage in June 1670 would indicate Ann would have been about ten years old when she married and had her first child with Judge William Budd. So unless other evidence comes to light, there appears to be no choice but to rule out Ann Budd as a daughter of John Claypoole through either of his two wives. This would also rule out any connection of Kevin Bacon to Brad Pitt through King Henry II.